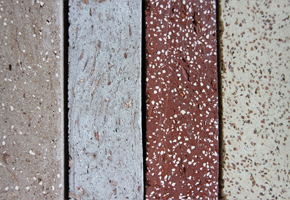 Tom van Soest, the Chief Creative at StoneCycling is the godfather of the WasteBasedBrick. 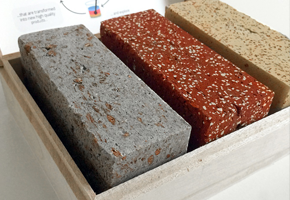 This is a new and sustainable brick made from natural and industrial waste. StoneCycling believes in a circular world. 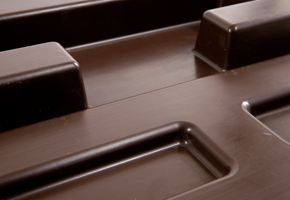 The primary input for new building materials can and should be waste materials. With the WasteBased-Brick, Tom is a frontrunner in the movement towards a circular building industry. StoneCycling is well on its way to becoming a major new player in the surface material market. Those architects and real estate developers with a penchant for something new and a taste for Aubergine, Truffle or Mushroom should especially take note, as these are names of various types of WasteBasedBricks. And that’s not all: perhaps your own waste could lead to something new. With his ‘Your waste, your brick’ principle, Van Soest is motivating property owners, municipalities and architects to develop a WasteBasedBrick together with him. This can lead to surprising opportunities and designs. It also increases owner awareness of the potential value waste has. 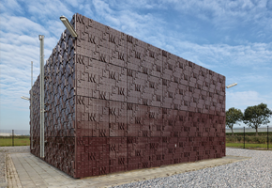 NPSP Composites, in close cooperation with Studio Marco Vermeulen and TOM – Tuinbouwontwikkelingsmaatschappij, has created the world’s first bio-based façade, building it in Dinteloord. The structure, a gas transfer station, is clad with 104 bio-based panels. These façade elements are made of Nabasco® (NAtural BASed COmposites) and are finished in a brown, opaque coating that gives them a state-of-the-art look not readily associated with natural fibres. 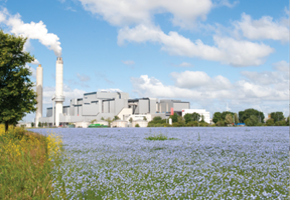 The exact constitution of the resin varies, but often soya beans, linseed oil and biodiesel production waste are used by NPSP. 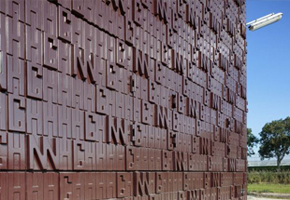 Each panel, measuring 140 x 185 cm, has the letters C, H and N printed in relief. These refer to the chemical symbols of the main components (carbon, hydrogen and nitrogen) of the gas handled by the station. The City of Amsterdam has joined forces with Waternet and RVR Hoofddorp to use part of their construction-ready land in Amsterdam Sloterdijk III temporarily for the cultivation of crops that serve as raw material for local manufacturing of sustainable products. 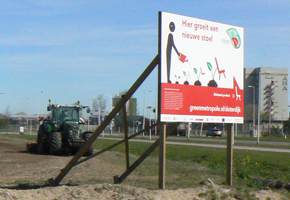 They work in collaboration with Schiphol that provides land for the same purpose. In 2014 and 2015, for instance, the land was planted with hemp, linseed and primrose. The yield of the various parcels of land is sold upfront to sustainable regional companies. RIGO Paint, for example, purchase the linseed oil using it to develop a sustainable paint for local production. 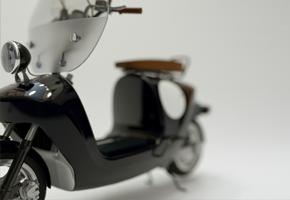 Moreover, the fibres of the different crops were used as basic material by NPSP Composites in the manufacture of a variety of products, with applications ranging from tables and chairs to scooters, boats and car doors. Conventional metal scooter frames have over one hundred separate parts and fourteen plastic covering caps. 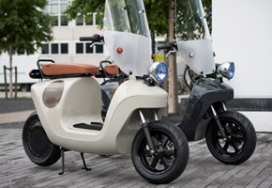 The structure of the Be.e electric scooter, however, is integrated into a single load-carrying monocoque made from natural fibre composites. 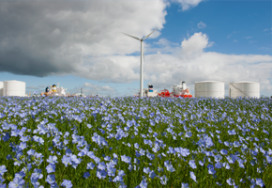 This material – produced from Dutch flax and bioresin – is extremely strong and ultralight. Hopefully, this innovative and sustainable prototype will lead to the application of high-grade biocomposites in all vehicle types. The team consists of the following parties: NPSP Composites, electric scooter manufacturer Van.Eko, flax supplier Van de Bilt Zaden en Vlas, mould manufacturer Modec, resin supplier Euroresins, resin manufacturer DSM, hemp supplier HempFlax, electronics developer Betronic, engineer Co.En, design agency Waarmakers, spray paint shop Ton de Rooij, Qwic and Inholland University of Applied Sciences.